Any serious woodworker or professional craftsman knows that the quality of the product comes down to the quality of the router used for woodworking. It’s not always easy to stumble upon that ideal router because many brands boast about theirs being “the best router for woodworking” and it’s not always the case. We’re here to do the dirty work and find you that perfect router for your woodwork with pros and cons and a handy router buyer’s guide following this post. 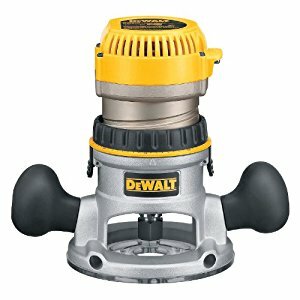 Here is the DEWALT 1.75 HP Fixed Base Router that comes with an 11-amp motor to make accurate, and clean cuts in tough hardwoods. Includes a micro-fine depth adjustable ring feature that will cut its depth in 1/64″ increment adjustments. The motor housing and the base engineered of the best precision-machined aluminum for extra durability. The router is compatible with DEWALT’s DW6182 plunge base and DW6183 D-handle base. We like the Adjustable, tool-free steel motor cam lock that creates depth adjustment and base changes fast and with solid-locking. Q - What comes with the router? A - Includes the DW616M motor pack, DW6184 fixed base, 1/4" and 1/2" collets, Sub-base concentricity gauge, and two wrenches. Q - Is there a LED light? A - No there isn't. Q - Is there a bag or case for the router included? A - No case or bag. Q - What size shank bits does it accept? A - It accepts 1/2 and 1/4 when you change the collet. Q - Does it have a soft start? Here is the Makita 1-1/4 HP Compact Router that provides users with the ultimate performance and precision with a conveniently compact design that resembles the size to laminate trimmers. Built for a range of routing applications using automatic speed to control and maintain a consistent and constant speed under a load and soft start for the best start-ups. We like the ergonomic, slim design of the body that enhances user control and comfort. Q - Can this unit be used on a router table? A - No, it's a compact router. Q - What shank bits does it accept? A - 1/4". You can buy the 3/8 collet to use 3/8" bits. Q - What all is included? And is there a bag? A - Includes 1/4" collet, straight guide, wrench #13, wrench #22, and a fixed base. No bag. Q - Does it have a light on its housing? Here is the PORTER-CABLE 690LR 11-Amp Fixed-Base Router that comes with a single speed of 27,500 RPM that works terrific at handling a wider range of applications with ease and accuracy. The dust-sealed switch, sealed ball-bearing construction engineered with machined alumina makes this router tool a reliable addition to your power tool arsenal for years to come. We like the over-mold grips and an under stop making it a comfortable and worry-free operation that will reduce downtime and enhance production. Q - Is there a plunge base available for this router? A - Yes! Model #POR6931. 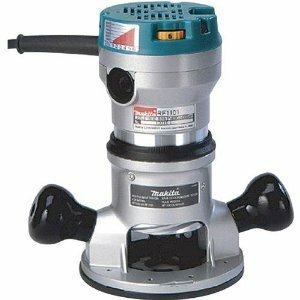 Q - Can it be mounted on a router table? A - Yes. It comes with a standard bolt pattern. Q - Is the router really loud? A - It's not quiet but it is one of the more quieter router tools available. Q - Does it come with a case? Here is the Bosch Colt Variable-Speed Router with Edge Guide that is incredibly versatile for delivering clean cuts while also performing trimming laminate flooring, deck planks, custom carpentry, and many other at-home and professional jobs.The powerful motor combined with the variable speed provides maximum accuracy, and we like the small, compact package for reduced user fatigue. Q - How much does the router weigh? Q - What are the size bits accepted with this router? Q - Is the case that's pictured included? Q - What is the maximum cutting depth? A - Range of 1-1/8", and the base opening is 1-9/16". 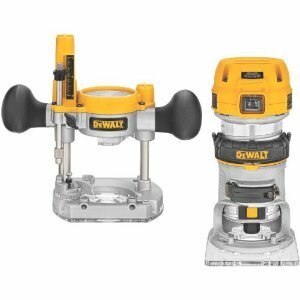 Here is the DEWALT DWP611 1.25 HP Max Torque Variable Speed Compact Router with Dual LEDs that allows you to be in control of the speed needed for the application at hand. It comes with a small, contoured grip that is close to the work surface giving excellent control and precision for creating small bevel cuts or larger edge profiles. We like the depth adjustment ring that delivers controlled bit depth changes up to 1/64". Q - What is the cord length? Q - Will it accept 1/2" shank bits? A - No. Uses 1/4" shank bits and 1/2" wouldn't be safe on a smaller router. Q - What does fixed-base router mean? A - Base doesn't plunge. Here is the Milwaukee 5615-21 1-3/4 Horsepower Router that features the very first tactile handgrip in the industry designed into the base of the router for quick and accurate linear depth adjustments with their patented above-the-table depth adjustment mechanism. 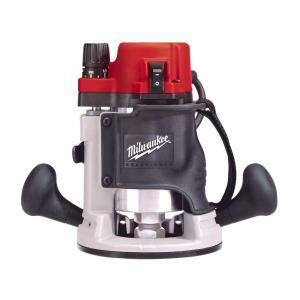 We like how the Milwaukee motor is powerful and precise giving users the upper hand in the heaviest cuts. Q - Is it a fixed base or can it change to plunge? A - It will fit into a plunge base as it's removable from the fixed base. Q - What size shank does it accept? A - 1/4" and 1/2" shank. Q - Is there a built in light? 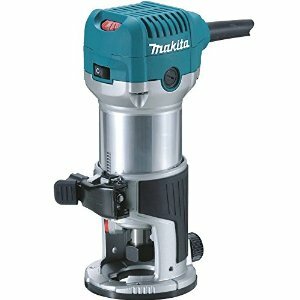 Here is the Makita 2-1/4 HP Router that has an incredibly powerful 11-Amp motor tackling the most demanding applications around and much quieter than most routers with a reduced noise rating of 81dB and reduced vibration for a much smoother operation. Designed with a soft start feature delivering smooth start-ups. It has an All-ball bearing construction extending the tools life and will accept 1/2" and 1/4" shank bits. Terrific tool – no cons found, yet! A - 1/4" and 1/2". Q - Are the collets included? A - Yes, both are included. Q - Does it include a case? Q - Is it a fixed base? 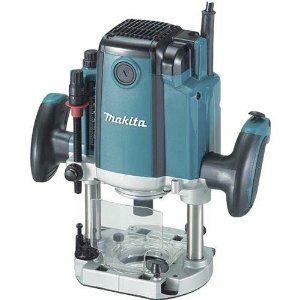 Here is the Makita RP1800 3-1/4 HP Plunge Router that is sure to deliver great precision with a smooth plunge action backed with superior performance. The RP1800 model also includes a 15-amp power and a no-load speed of 22,000 RPM with an increased plunge capacity for working with a wider range of applications such as windows, cabinetry, doors, woodworking and more. We like the built-in fan that has a labyrinth construction that reduces any dust entered into the tool which will extend the life of the tool. Q - Does the depth adjustment work when mounted upside down under a table? A - Wes, when not used as a plunge router. Q - What shank bit does it accept? Q - What is the weight? Q - Is it a variable speed? A - No it's not a variable. Here is the Hitachi M12V2 3-1/4-Peak Horsepower Plunge Router that comes with an operator controlled variable-speed motor featuring an excellent soft-start technology designed for smooth groove cutting, window cutting, trimming, chamfering, shaping and much more. 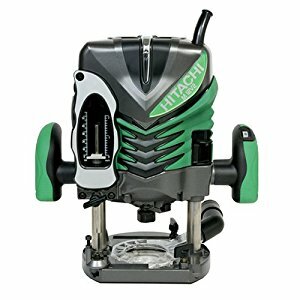 We like that this is an updated version of the popular M12V router by Hitachi that comes with additional features for enhancement in performance and usability making the M12V2 perfect for any carpenter and woodworker. Q - Does it include a carrying case? A - Yes, a plastic case. Q - Does it include a light? Q - Does this use same base/pattern (to mount on an insert plate on router table), as the older M12V version? A - No. You could mount the new one as the screw holes will line up a bit then have it modified. Q - Are there any collets or a guide included? A - It includes a router edge guide along with both 1/2" and 1/4" collets. 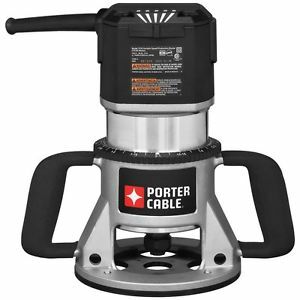 Here is the Porter-Cable 7518 Speedmatic Fixed Base Router that includes a 15-Amp and 3-1/4 Horsepower that delivers the durability and power you need for your toughest job applications. We like the soft start safety feature that will minimize the torque at the start-up while the motor will contain its constant speed under load. The 5-speed motor is ideal speed setting for the job. 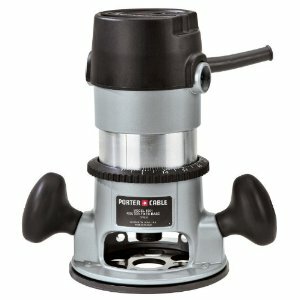 Top Porter-Cable Router Tool Questions & Answers? Q - How the auto-release collet system works? A - There is a nut on the bit that you loosen twice, that is you keep loosening, and the second time it builds up tension and is relaxed the bit is forced free. It works well without having to tap your bit to break it free. Q - How big is the hole in the sub-base? A - In the black plastic sub-base, the center hole is 1 3/8" diameter with a 1 3/16" diameter recessed lip to hold the Porter Cable style bushing guides. Q - Can the base be removed, so it fits in an Incra or a Jessem lift system? A - Yes it can be removed. Routers are one of an essential power tool to have when you're a professional craftsman or woodworker and needing to do various DIY projects around the home. Routers are an ideal tool for making sharp edges, duplicates from a pattern, making cutouts, and doors, etc. Here is our router tool buyer's guide to help you find the ultimate beast that will be right for the job while highlighting specific types of routers. Routers are designed as a plunge base or a fixed base while some routers are built with the ability to switch between the two types. Interchangeable: Interchangeable bases are much easier to transport than other routers and are more economical. Ideal for operators that want different base styles and different handle styles or want the ability to upgrade or diversify their needs. Plunge Router: A plunge housing will give a more controlled vertical movement during a cut allowing you the ability to plunge the bit into a surface for workpieces without trouble. This ability makes for easier through cuts, mortises, and grooves along with template and pattern work. Fixed Base Router: The fixed base routers are ideal for edge shaping making it easier to maneuver which makes for an all-purpose router. 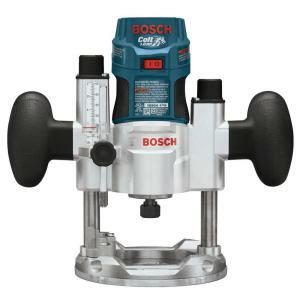 When looking to buy a router tool the two features to keep in mind are the collets and the horsepower. The collets will determine the bit size that the router will accept. The horsepower will determine the strength the tool will hold. Horsepower: Most are in the range of 1-1/2 to 3-1/2, with a range of 3 to 15 amps. Maximum HP should run for a short period. Routers: Routers are available with 1/4" and 1/2" collets, which determine the size of the bit shank the router will accept. Routers with 1/2" collets are a lot more versatile as this size shank bits come in larger diameters, and many routers include adapters that will accept both 1/2" or 3/8" bits. If you do work with the larger bits, make certain that your router is capable of performing at slower speeds. Soft-Start: The soft start feature eases the router speed up in a more gradual style preventing the tool not to jerk out its position. Variable Speed: Many routers provide the user with an electronic variable speed (EVS) control, and this allows the operator to select the ideal speed to match the applications and bit sizes. You need to keep in mind that when you buy an entry-level router, it will only accept the 1/4" bit shanks. If you're looking to use a 1/2" bit, then opt for the more powerful routers that come with an interchangeable collet that accepts attachments for various bit sizes. The larger bits will be a bit more pricey than the 1/4", but they reduce the risks up slippage with an increased diameter for extra clamping surface for the collet. Many popular models come with features such as V-groove, flush trim, chamfering, and a round-over, etc., so you may not need to make a bit decision until one is needed.